Dr. Briceño is a specialist in ophthalmic plastic surgery, a field that involves aesthetic and reconstructive surgery of the eyelids, eye socket (orbit), and tear duct system. He has special expertise thyroid eye disease, orbital trauma and reconstructive surgery of the eyelids and upper face. He also has expertise in cosmetic eyelid, brow and midface surgery and minimally invasive cosmetic procedures such as Botox injections and fillers. 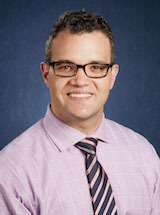 Dr. Briceño is interested in studying surgical and quality of life outcomes in eyelid, orbital and lacrimal surgery. He is also interested in finding ways to enhance medical student and resident education, especially in surgical settings. He is also interested in finding novel ways enhance provider diversity within the surgical subspecialties. Gupta S, Briceño CA, Nelson C, Douglas RS. : Customized Minimally Invasive Orbital Decompression for Thyroid Eye Disease. Expert Review of Ophthalmology. Oct 2012. Briceño César A, Gupta Shivani, Douglas Raymond S: Advances in the management of thyroid eye disease. International ophthalmology clinics 53(3): 93-101, 2013. Briceño César A, Zhang-Nunes Sandy X, Massry Guy G: Minimally invasive options for the brow and upper lid. Facial plastic surgery clinics of North America 23(2): 153-66, May 2015. Briceño César A, Zhang-Nunes Sandy X, Massry Guy G: Minimally invasive surgical adjuncts to upper blepharoplasty. Facial plastic surgery clinics of North America 23(2): 137-51, May 2015. Briceño CA, Massry GG : Chapter 10: Minimally Invasive Complementary Adjuncts to Upper Blepharoplasty Master Techniques in Facial Rejuvenation, Second Edition. Azizzadeh B, Murphy M, Johnson C, Massry GG (eds.). Elsevier Page: 107-119, 2018. Briceño César A, Elner Victor M, Demirci Hakan: Lymphangiogenic and Chemotactic Factors in Conjunctival Melanoma. Ophthalmic Plastic and Reconstructive Surgery 32(6): 428-433, Nov/Dec 2016. Ballard Tiffany N S, Briceño César A: Minocycline-induced orbital rim discoloration. Journal of AAPOS 20(2): 182-4, Apr 2016. Cani Andi K, Soliman Moaaz, Hovelson Daniel H, Liu Chia-Jen, McDaniel Andrew S, Haller Michaela J, Bratley Jarred V, Rahrig Samantha E, Li Qiang, Briceño César A, Tomlins Scott A, Rao Rajesh C: Comprehensive genomic profiling of orbital and ocular adnexal lymphomas identifies frequent alterations in MYD88 and chromatin modifiers: new routes to targeted therapies. Modern Pathology 29(7): 685-697, July 2016.